Skyrim has come to the Amazon Alexa, in the form of Skyrim Very Special Edition - this is not a joke, even though Bethesda treated it like one in its press conference. Bethesda has had a busy E3 2018, announcing Elder Scrolls VI, showing off what Fallout 76 is actually going to look like and also revealing some new Doom Eternal and Wolfenstein VR action and new IP Starfield. But perhaps the most intriguing launch was initially a joke: an Alexa modified version of Elder Scrolls. But now it is actually something you can 'play’ on your Alexa. Skyrim has been ported on to pretty much every console around now, and that is what Bethesda was riffing on when it was shown off in a video that showed Michael-Key playing it on a Samsung smart fridge and pager, as well as an Amazon Echo. Soon after the video went live, however, so did the Skyrim Very Special Edition Amazon Skill. It's actually real, albeit in a very tongue-in-cheek way. 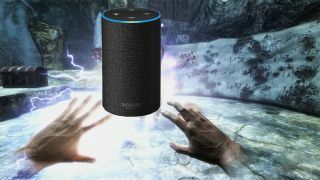 "Bethesda Game Studios is proud to present Skyrim... for Alexa. Yes, that’s right, the version of Skyrim you never saw coming has finally arrived on the platform you never asked for," says the Amazon release. "For the very first time ever, take your rightful place as the Dragonborn of legend (again) and explore Skyrim using the power of your own voice...your Thu’um!" Given Amazon has a number of games on Alexa, it's good to see them play along and create a skill. It already has RPGs Dungeon Adventure, and Shadow Run so why not a dragon-battling multi-threaded choose your own adventure, complete with Skyrim mythos? To play Skyrim Very Special Edition on an Alexa device is really simple. First you have to download the Skill, which is available from this link. Once the Skill is linked to your device, you then say "Alexa, Open Skyrim" and the quest starts. In the quest, you have the option to explore the dungeons of Skyrim, master your weapons, spells and shouts, encounter people who constantly need your help and also Guard your knees against arrows. Amazon definitely isn't taking this too seriously... and for good reason. Unfortunately, it looks as if the skill is currently only available in the US version of the Amazon Alexa Skills store. You can play Dark Brotherhood Trivia for Elder Scrolls until it does become available, though. Or watch the clip below of someone trying it out on their Amazon Echo.